BMW may call this the "Concept" 6 Series Coupé, but we'll call it what it is: a near-perfect first look at the 2012 BMW 6 Series. What's it show? How about a simplified, de-Bangled exterior and updated interior. No matter how many of the previous generation BMW 6 series coupes and convertibles they sold, it was still an ungainly and mostly unloved iteration of the company's coupe heritage with too much weight, too much Bangle, and not enough performance to overcome its many shortcomings. 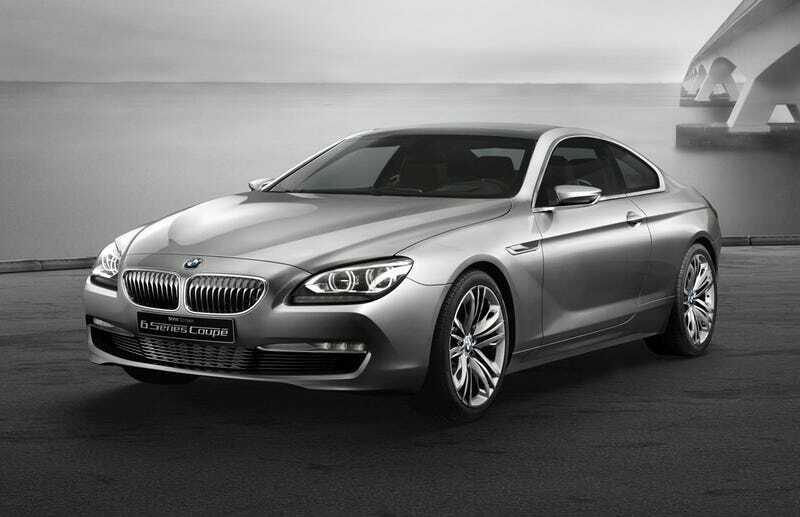 Enter the "Concept" 6 Series set to debut in Paris in two weeks. This latest iteration mimics the new 5 series with its birthday candle-level of flame surfacing and minimalist detailing. It's not revolutionary, but they've made the evolutionary move from Homo Sapien to Homo Erectus and back to Homo Sapien. The progression is attractive and, with the muscular athletic rear profile, maybe even a touch aggressive for a giant luxo-coupe. There are no power numbers, engines, or any other technical specifications given but the interior does indicate the inclusion of a large, floating iDrive screen and a heads-up-display feature that could make it on the final version.